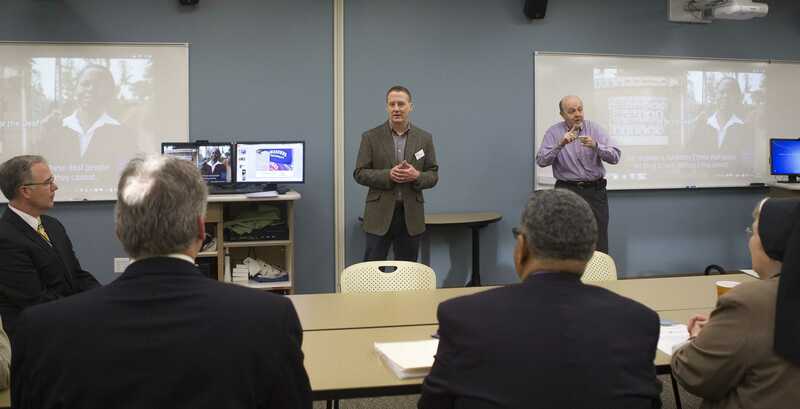 Schoolcraft College and Madonna University have collaborated for a one-of-a-kind program. The Sign Language Studies Dual Degree was officially authorized Nov. 12 by school presidents Dr. Conway Jeffress of Schoolcraft and Sr. Rose Marie Kujawa, Congregation of the Sisters of St. Felix, Ph.D of Madonna. Students can earn a bachelor’s degree in four years by taking classes at both Schoolcraft and Madonna. Financial aid will be accepted at both institutions. General education classes will be held at Schoolcraft while sign language courses will take place at Madonna. The partnership includes a Bachelor of Arts in Sign Language Interpreting studies, Deaf Community studies, and Sign Language studies. Minors and certificates of achievement are also available. The cooperation began over a year ago when Laurie Kattuah-Snyder, Schoolcraft’s Associate Dean of Advising and Partnerships, and Michael Quattro, Madonna’s Director of Undergraduate Admissions, had a meeting. Quattro asked at the meeting, “Wouldn’t it be nice to have a sign language program?” After many edits, the proposal has come to fruition. The labs used for the Sign Language department at Madonna University are unlike anywhere else in the country. They are designed to have students individually record themselves signing. Language shapes the way one thinks. Whether listening to a persuasive speaker, absorbed in powerful writing, or engaged in a conversation, language introduces new ideas, perspectives, and opportunities to all. Many states have passed laws recognizing American Sign Language (ASL) as a complete and natural language. Hundreds of colleges and universities throughout America now accept ASL in fulfillment of language entrance and exit requirements. Having the skills to speak, read, and write more than one language fluently is a skill that is coveted by many employers. The top industries for bilingual candidates today, according to careerbuilder.com, are healthcare, financial services, social services and public service. Being bilingual could make the difference between snagging a high-paying regional sales job and being stuck in a lower paying job. The skills are useful in any career and holds many job incentives. In the Sign Language Studies Dual Degree, classes are diverse. One course teaches students how to give presentations and another is more focused on teaching students how to sign while hanging out with their friends. Dual-majoring in sign language and film is also available. Programs like this do not come around often, and the partnership not only benefits students, but the community at large. For information, you can log on to Madonna University’s website www.madonnasls.com, and to watch the creative final project where students used sign language in a music video, log on to www.